ScanMyPhotos.com is digitally preserving millions of photo snapshots as part of the Photo Preservation Center's Great American Photo Scanning Project. To promote the need to have the estimated 3.5 trillion analog photo snapshots digitally preserved, The Great American Photo Scanning Project is now underway. 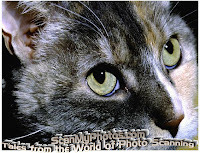 Created by The Photo Preservation Center, and sponsored by ScanMyPhotos.com, this is a big idea. We share it with you to help promote the goal: quickly protecting generations of family photos that are fading away and inspire people across the country to have their shoeboxes of analog photo snapshots digitally scanned. 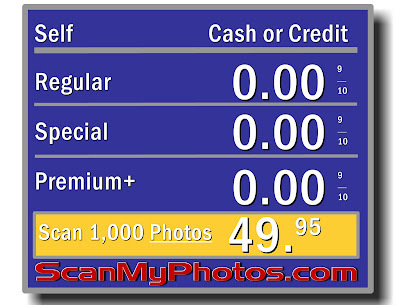 ScanMyPhotos.com is providing up to 1000 free photo scans to members of four leading social networking sites. 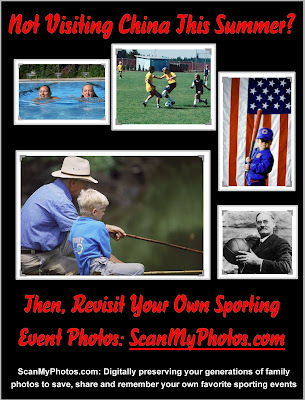 If you are a member of either Flickr, MySpace, Blogger or Facebook you get up to 1,000 4x6" photos scanned to DVD without charge when you mail your properly prepared 4x6" photos to ScanMyPhotos.com; pay $19.95 for return S&H and include the downloadable order form. We just ask that you post a review from your experience with us on your Blog or personal networking page. 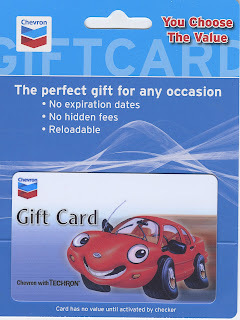 The Photo Preservation Center is providing a national network of service providers to compliment the retail and direct mail photo scanning services by ScanMyPhotos.com. For a local listing of photo scanning service providers who are current members of the International Photo Marketing Association, click here. For a local listing of photo scanning service providers who are current members of the Independent Photo Imagers, click here [enter zip code in the upper right side prompt on their website]. Check back for more information on The Great American Photo Scanning Project. A recent survey found that one in three 16- to 24-year-olds have lost or accidentally deleted their digital images. The survey, commissioned by CeWe Color, found that 86 percent of people do not print digital pictures, but often leave them on computers, mobile phones or digital cameras to be forgotten, lost or deleted. Digital photos are increasingly being left in storage although the poll found that 48 percent of people prefer to look back on their pictures in print rather than digital format. Andrew White, internet sales manager, CeWe Color, believes that one of the main reasons why so many digital images are stuck on CDs, USB sticks, and other storage devices is because people do not have a convenient way of turning them in to prints and albums. "The survey shows that most people prefer prints but because so many of us lead a hectic lifestyle, this often gets overlooked. We tend to think that they'll be safe indefinitely on a CD or a memory stick, but this isn't necessarily true and there's always the real risk that they can be lost, or the media on which they are stored becomes obsolete in the future, with no way to access the photos." The survey was commissioned by CeWe Color and conducted by GfK NOP, which interviewed 1,001 adults aged 16 or older between March 7 and March 9. ScanMyPhotos.com is only half the story, the real magic begins when you view your newly scanned photos, slides and film. "The Louvre of Photo Scanning"
To us, it is more than an art, it has been our passion since 1990 to help preserve your photo memories with extraordinary professionalism and super-fast turnaround. 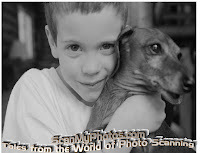 When you visit ScanMyPhotos.com, we recommend you also click on our "In the News" section to encounter just why many of the nation's largest media outlets are raving about the photo scanning service that we pioneered by commercializing Kodak technology. 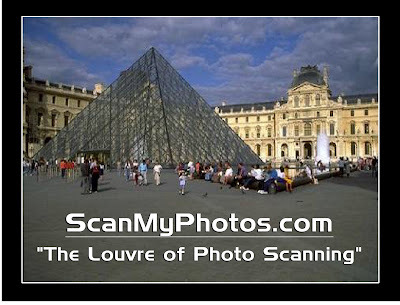 For a direct link to ScanMyPhotos.com and Tales from the World of Photo Scanning, click here. Bad news: Did you also read today that there was another record jump in crude prices, this will quickly translate into even high fill-up at the pump charges. Solution: I recommend you review your daily driving habits and see what chores you can cut out or overlap to make just one car trip. As for photography, thanks to technology, you can use the ScanMyPhotos.com at home service to access their in-store photo kiosks to make your own photo enlargements, collage prints, scrapbooking pages, albums and dozens of other popular products. When you're done ordering, choose to have it delivered and you just saved on gas. Even if you're in a rush, their orders are all completed and mailed back the same business day. 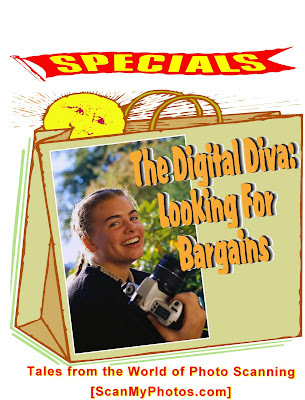 But, here's another Digital Diva tip with entertainment that can last a day and it's a lot of fun. Gather your family for a photo scanning party. Ask each person to bring all their snapshots - those thousand of pictures in shoeboxes. You collect and send off in the ScanMyPhotos.com prepaid boxes. Another gas saver too. And, this is a two-part party. 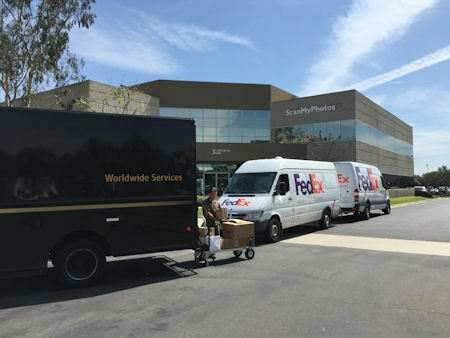 The same day the scanned pictures are received at the ScanMyPhotos.com Irvine headquarters, it is completed and mailed back. Then the real fun begins. Call your friends and relatives over for a premier party. Gather everyone together and create a special celebration of all your adventures together. Tip: Use a video camera to record the event and have all your guests comment aloud about each picture, scene and memory, explaining who the "in-laws" and "out-laws" were, and why. This is a smart tool for recording and preserving your family's genealogy. Get everyone involved, take turns playing cameraperson and zoom in on the people speaking, capture their expressions and emotions and record all the photos too for a lasting keepsake. If you are adapt at iMovie and other programs, like Powerpoint, just record the guests talking and add the photos afterwards as a split screen. What a smart idea! Memories happen everyday! Capture your everyday moments with special scrapbook pages! Relive your special day with a wedding memento scrapbook. With the click of a few buttons on your keyboard you can fill in the blanks. Add your favorite photos plus a personalized journal message or just a name or title to your custom Kodak-quality 12x12" photo scrapbooking pages. Order right now and it's ready in minutes and mailed back nationwide the same business day. Zero experience need and please use our 24/7 Live Support help desk to solve any questions you might have. For Orange County, Calif. ScanMyPhotos.com customers, you can choose either the o nline photo service, or visit us and use our in-store photo kiosks; we have thousands of design templates and projects, from collage, scrapbooking, photo greeting, invitation and announcement cards and more. 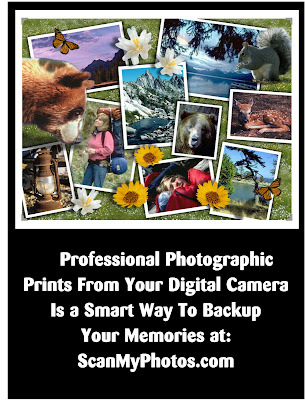 Preview of the new ScanMyPhotos.com national print advertising campaign. Click on image to enlarge. Thanks Gretchen Clark from Arizona for your recent ScanMyPhotos.com orders and blog comments below. 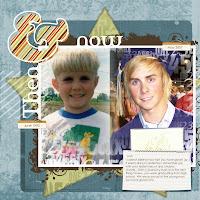 To view Gretchen's very creative "This n' That" blog, click here. 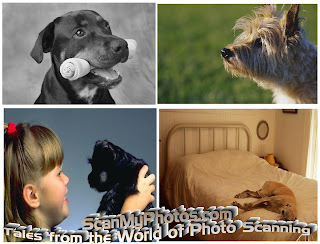 "A while back I sent in all my photos to ScanMyPhotos.com to have them put on disk. I started going through the files on Wednesday evening to look for a vertical photo of Josh...before I knew it, the whole family was hunched around the computer going down memory lane and laughing with me at some of the 80's hairstyles Mike and I were sporting (I hope the perm never comes back!). I also couldn't believe how young Mike looked, I was so glad I hadn't aged any..LOL! I could just look at pictures all day! Needless to say I got a little distracted. I was glad to get my layout completed last night and posted to our class gallery." Did you know: The average ScanMyPhotos.com order contains about 2,000 analog photo snapshots - spanning generations which are digitized. Along the way, many clients across the country and overseas have been looking for additional products to help edit those special photo memories. Thanks to Adobe, there is a new, fun and free solution. 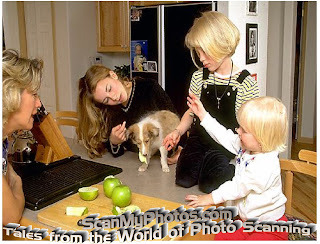 While ScanMyPhotos.com provides its Crystal Diamond Photo Enhancement and custom Photo Restoration services, along with a buffet of other helpful add-on services, clients often ask for ways compliment their photo scanning experience by editing special pictures. But, they want it fast and the photo editing must be easy. We are devoted Walt Mossberg fans; today, his "Personal Technology" WSJ column reviews the new Adobe web-based photo site which is celebrated for editing your newly digitized pictures. As Mr. Mossberg explained, Adobe simplified their award-winning program for the web with the new, and free web-based Adobe Photoshop Express®. Click here to read his review [WSJ subscription required]. The new Adobe PhotoShop Express free beta online software brings Photoshop technology to anyone taking digital photos and is ideal for all ScanMyPhotos.com customer and the millions of pictures, slides and negatives that have scanned for people around the world. 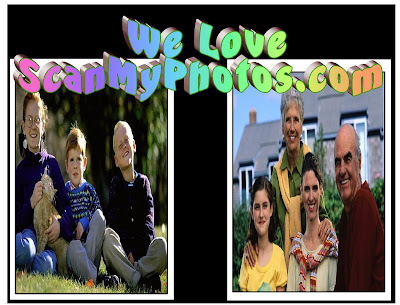 A leading group of consumers who are avid ScanMyPhotos.com customers are scrapbookers. Beyond the recent digital photos, they need to get thousands of analog pictures, spanning generations digitized too. 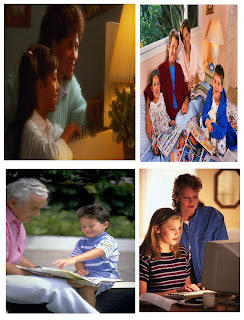 Once their ScanMyPhotos.com orders are returned, ordering custom photo memory albums, coffee table photo books, and hundreds of other photo products, from photo invitations to photo greeting cards and calendar are conveniently available from the ScanMyPhotos.com online ordering service. Here is a directory of Scrapbooking sites that might be helpful to you for assisting with your photo projects. Best Value: The Family Generation Collection - 10,000 photos scanned, plus two free double-sided 20-page Photo Memory Albums, just $495.95. VHS tapes degrade with both time and usage. Preserve those video memories by transfering them to DVD before it is too late. Nothing is more emotional than the loss of your pet. Just ask the grieving family members. 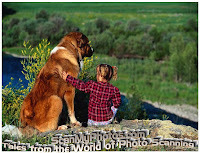 Because of the sensitivity of working with clients across the nation who face the task of pooling together their family photos to design a one-of-a-kind memorial photo legacy in their pets memory, ScanMyPhotos.com is extra sensitive to these issues. Yesterday, we received the following poem from a photo scanning client who designed a photo memory journal online from their scanned pictures and added the poem, with one or two sentences per page. It was so moving, but important to help the grieving family memorialize their special memories. Treat me kindly, my beloved master,for no heart in all the world is more grateful for kindness than the loving heart of me. When it is cold and wet, please take me inside,for I am now a domesticated animal, no longer used to bitter elements. And I ask no greater glory than the privilege of sitting at your feet beside the hearth. Though had you no home, I would rather follow you through ice and snow than rest upon the softest pillow in the warmest home in all the land, for you are my god and I am your devoted worshiper. Keep my pan filled with fresh water,for although I should not reproach you were it dry, I cannot tell you when I suffer thirst. Feed me clean food, that I may stay well, to romp and play and do your bidding, to walk by your side, and stand ready, willing and able to protect you with my life should your life be in danger. And, beloved master, should the great Master see fit to deprive me of my health or sight,do not turn me away from you. Rather, hold me gently in your arms as skilled hands grant me the merciful boon of eternal rest -- and I will leave you knowing with the last breath I drew,my fate was ever safest in your hands. If you are facing the unfortunate task of designing a special memorial for the loss of your pet, click on this link for other poems for grieving pet losses that you can personalize to add to your Photo Memory Journal. To help personalize your Photo Memory Journal and custom scrapbooking and collag e photo enlargements online or using our in-store photo kiosks, please click here for our 24/7 Live Support to reach our Customer Support Specialists, or call: 949-474-7654. [Due to the ScanMyPhotos.com policy to preserve the privacy of our clients, the above photos are public domain and not from actual client scans]. More than six-million photo snapshots have been digitally preserved by ScanMyPhotos.com and each one holds special, irreplaceable memories. From our celebrity clients, to just scanning those ordinary decades-worth of photo snapshots once stored on the top shelf in the closet, every picture matters. A customer just shared this LInk with us to demonstrate the importance of digitizing historical pictures. 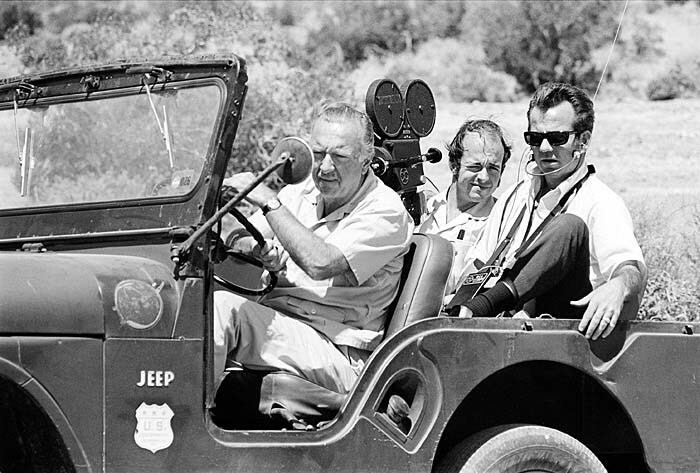 In this case, the photos represent a special once-in-a-lifetime visit by the famed TV news personality, Walter Cronkite. While we did not scan these pictures, it showcases why everyone must protect those otherwise fading memories. 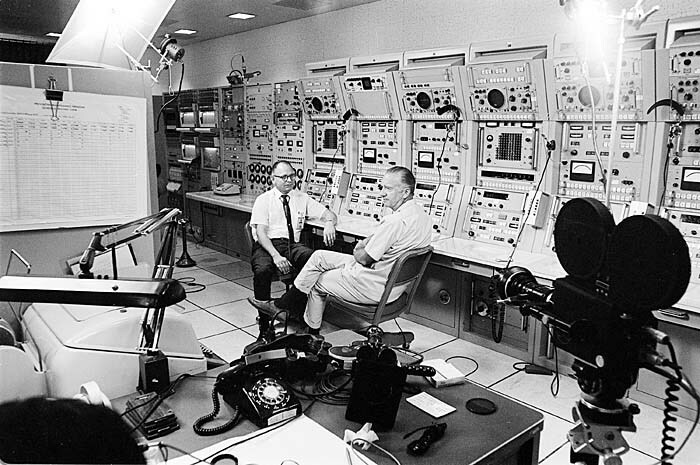 Please click on this link for complete information about the CBS News visit to the Goldstone Deep Space Tracking Station before the Apollo 11 Mission. 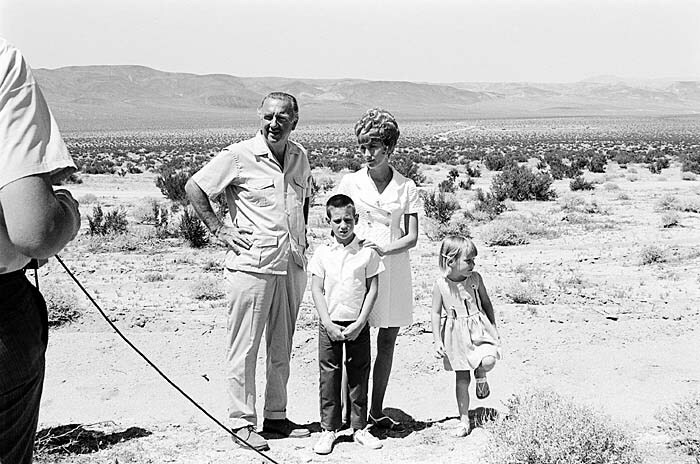 Background from the website: "Bill Wood took photographs on July 4, 1969, during a visit by Walter Cronkite and his CBS News film crew to the Goldstone area in preparation for the Apollo 11 flight to the Moon. 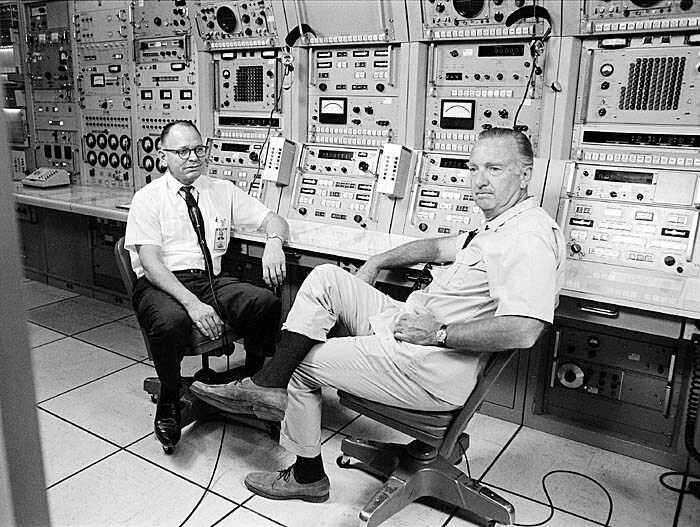 At the time Mr. Wood was assigned to the NASA Manned Space Flight Network Apollo tracking station at Go ldstone, California as a Unified S-band Lead Engineer. Since his hobby was photography the NASA Station Director, George Farris, asked him to shoot a few pictures of the CBS crew’s visit. None of the original photographs have been copyrighted and Bill Wood has released all into the public domain. All reproduction rights have been waived." 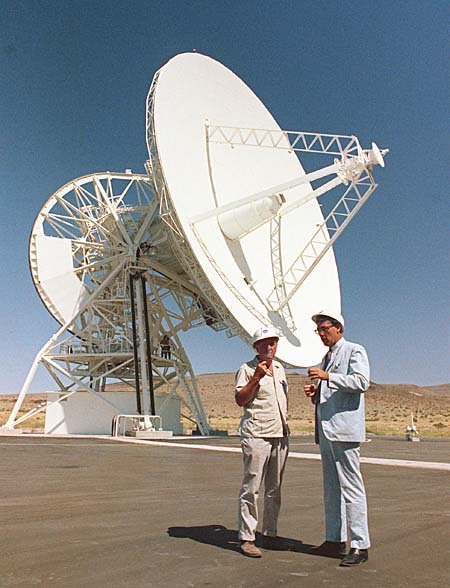 From Wikipedia, the free encyclopedia: Goldstone Deep Space Communications Complex (GDSCC) —commonly called the Goldstone Observatory— is located in California's Mojave Desert (USA). Operated by ITT Corporation for the Jet Propulsion Laboratory, its main purpose is to track and communicate with space missions. It includes the Pioneer Deep Space Station, which is a U.S. National Historic Landmark. The current observatory is part of NASA's Deep Space Network. 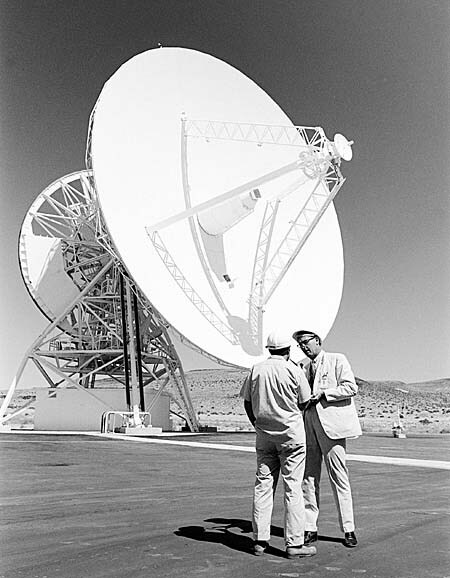 The Goldstone Deep Space Communications Complex is just one of three in the world; the others being the Madrid Deep Space Communication Complex and the Canberra Deep Space Communication Complex.